But of course all the CRUD action happens in the backoffice and I thought it would be nice to allow you to easily genereate forms based on your UI-O-Matic models that you can use in the front end of your site. So I’m glad to present you a couple of Umbraco Forms addons that will make it super easy to link and submit data from your custom db tables. The UI-O-Matic workflow type allows you to extend the functionality of a form in this case it will allow you to submit your record to a database table. If you have ever used the save as Umbraco document workflow type it will look very similar, first select the type of object then you can map the different properties on that object to record fields or setup a static value. And finally there is also a UI-O-Matic datasource type that will give you the option to generate a form based on a Model. Simply select the type of object and then follow the wizard. You can simply install it from Nuget. Of course this depends on Umbraco Forms and UI-O-Matic but Nuget should take care of the dependencies if you haven’t already installed them. I’ll try to do some follow up posts with real world examples. Today UI-O-Matoc 1.1.0 is available (get it from nuget), it features 2 new improvements coming from community pull requests! So thanks Tom Fulton and Serena Benny. With this new attribute you can mark a single property that will be used as the ‘name’ field of your object, in the UI it will now appear at the top (so making it even more consistent with the Umbraco UI). 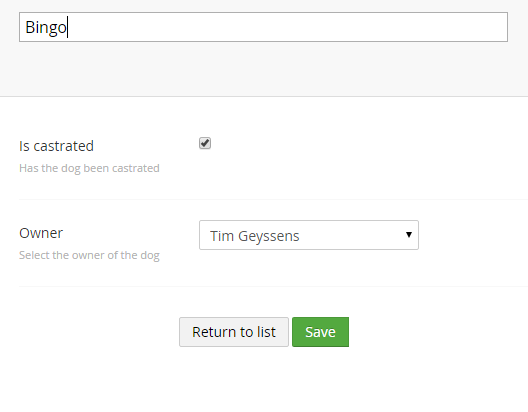 Besides building a crud UI for your custom tables UI-O-Matic also comes with a property editor that should make it easy to integrate your custom data with the content,member and media sections of Umbraco. And now with at least one class in place we can create a new datatype using the UI-O-Matic prop editor. So in this case I want a person selector on my document types that is driven by the data coming from the third party table. So first select the prop editor UIOMatic Dropdown and then you’ll have to specify some additional settings. So with all of these specified we’ll get a new datatype that we can use on content/media/members and that looks like (so a dropdown populated with data coming from the custom table). UI-O-Matic also provides the option to display your objects in a listview (since the tree isn’t the best choice when working with a lot of data). The listview allows you to sort by column and also filter by searching (all of this is server driven so should allow working with large datasets). If you wish to exlude certain columns/properties from being displayed in the listview you can decorate your properties with the UIOMaticIgnoreFromListView attribute. Special thanks to Tom Fulton for his contributions to the listview. From noticing a couple of questions on the our forums, it seems like plenty of folks don’t know how you would start with adding less/sass/coffeescript/typescript to your Umbraco project. One of the easiest options is to use Optimus, it’s main feature is to do bundling and minifications. But besides that Optimus also features a provider model for dynamic css and js languages. When installing the Optimus core the final step of the installation will let you install additional providers for dynamic styleheet (less, sass) and script languages (coffeescript and typescript). These will then compile to css (in the case of less and sass) or js files (in the case of typescript and coffeescript). In the previous post I showed how you can use the media picker in your custom backoffice pages, now I’ve reworked the example by using an Angularjs directive. So with a directive we’ll end up with a component that is easily reusable accross different pages. This directive has been added to the example project. I’ve extended the Custom sections/trees/Pages/Dialogs in Umbraco v7 example project with the use of a media picker. I’ll quickly outline the bits needed. So we set the pictureId property of the person to the id of the returned media entity. To display the node name and node icon we set a node property on the model. So this will now work to select and remove an item but we also need to make sure that when the page loads the node property on the model is populated (making use of entityResource so make sure to inject that). In that case it should just be a matter of adding an additinal entry to the EmbeddedMedia.config file. Let’s say you want to support videos from TED. So with those details I can add a new entry to the config file (just look at the existing ones to get an overview of the xml elements you need). Even if the third party service doesn’t offer oembed support it’s still possible to provide this easy way of inserting rich content. Since you can write custom providers, so if the service has an API you can take advantage of that. Here is an example of a custom provider, this one adds Giphy support.